The Deloitte building formerly known as Athene Place has been pre let to Deloitte. Over the summer, HP and Endurance Land have been negotiating the early surrender and subsequent pre-lease, back to Deloitte for the consolidation and expansion of their Digital arm. 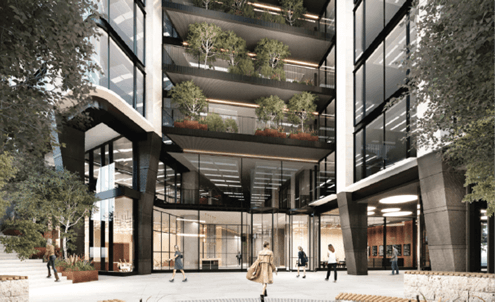 The 73,500 sq ft leasing comprises approximately 50% of what will be a newly refurbished and extended building, benefing from its own dedicated entrance off a revitalised courtyard. Endurance Land and Henderson Park, took full control of the building in June this year and have submitted plans to the City of London for the repositioning of this Grade A asset, including a striking canopy, additional 9th floor and balconies, providing terrace space on all floors. Jonathan Fletcher CEO of Endurance Land commented ‘Having sourced and secured this asset with our partners in a competitive market we are very excited about inviting Deliotte Digital to Shoe Lane. We are excited about working with them to enhance this first class development’. Bh2 acted for the Joint Venture, whilst DeVono Cressa represented Deloitte. This letting leaves a the remaining 72,376 sq ft over 4 floors with a dedicated entrance on Shoe Lane to let. The remaining space benefits by been directly opposite the soon to be complete Goldman Sachs HQ. Bh2 and CBRE are retained to dispose of this fantastic self-contained opportunity. Richard Rixson, Director at EL commented “To have pre-let half the building to the incumbent tenant, prior to the obtainment of vacant possession, has proved quite an achievement, particularly this early in the business plan and is representative of the teams considerable efforts to date”.